I’ve been busy doing a shop renovation (click on the Blog link in my signature for more detail) and finally have my machinery moved around enough to plan on a design for the cabinet. It is going to keep me busy for a while! I’m open to comments and suggestions, so here is a drawing of the current idea. It is based on a Shaker Step-Back Cupboard, and is 16” deep at the base unit, 12” deep on the top unit, and closes with frame and panel doors. Let me know what you think! Hi Barb, your scan is not very easy to read, might want to try & darken up a tad, easy to see you have had a good think about what you want to achieve, looks good as far as I can tell. BTW, your link to “shop, renovations” doesn’t seem to go anywhere? Thanks, Pete. The link worked when I put it there… hmm. It’s a link to my blog, and you can use the bottom signature link to get there if you want more detail of the shop renovation I’ve been working on. Sorry your screen shows the .jpg too dark. 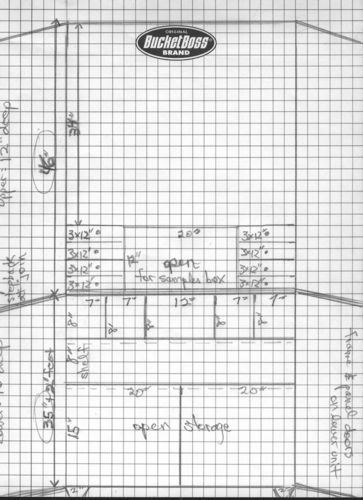 It’s on graph paper and appears on my screen as readable, but it’s quite general as plans go. Hey pete, turn up the contrast on your monitor … I can read it quite well, even though it looks like a scanned image. Barb, Looks to me like you’ve put a lot of thought into this and it is designed around your needs. So many of my shop cabinets have plain flat doors, (‘cause it’s quick and easy) I really like your idea of using raised panel doors. On my last one I inset the interior shelves 2” and put narrow shelves and hangers on the inside of the doors (Think of it like a spice rack if you will …) an amazing amount of this and that fits there. I’m looking forward to seeing the build and finished piece. Yes, it is a scanned image. I don’t have a CAD program or the likes. Thanks for the encouragement; I’m jumping into this with both feet! He also uses such a cupboard. You can see it in most of his pictures and videos. Paul Sellers’ one is “frame and panel” with plywood panels (in US at least the one in England seems more traditional). Way to go, Barb. This will be a wonderful addition to your shop and will make an interesting blog. U can’t waut to see how it progresses. Thanks for the link to Paul Sellers’ cabinet. All the input I can get is helpful. I like that you seem to be keeping open space for figuring out and rearranging tools. As much as I love the look of all those french fitted niches everywhere, you’re pretty much stuck with them. Makes fitting in new tools very difficult. Maybe consider making the doors as boxes about 3” deep. You can still do frame and panel, but have that extra room to hang smallish things inside and out. I think that designing a tool cabinet might drive me nuts. The options are endless. Ill be keepin my eye on the progress barb. Whats the wood of choice? I haven’t yet priced it locally, but I’m leaning toward cherry case framing and cherry ply for the panels. Checking the wallet.